Young basketball fans growing up today are no longer fantasizing about themselves performing a tomahawk dunk in front of thousands of screaming fans. They’re shooting it from beyond the arc instead. There’s a reason that Stephen Curry’s jersey is the most popular in the entire league. It’s not just because he’s an excellent three-point shooter. It’s because he’s the three-point shooter. And the three-point shot is now the height of cool. Stephen Curry has revolutionized the game of basketball to the point where every team in the league is now adjusting their squad to be like the Golden State Warriors (or at least to be more like them). Having a plethora of solid shooters on your team is no longer a perk – it’s practically a requirement. Let’s just call it a new approach to maximizing your points. After all, three is certainly more than two. The amazing thing about the three-point shot is that it was only implemented into the NBA in 1979 – the year that, coincidentally, Magic Johnson and Larry Bird entered the league. At that point, people certainly shot it from long range, but it wasn’t a very common occurrence (even for Bird, who was a menace from long range). It was almost a gimmick, almost like players felt like it didn’t belong – especially when going for the solid two was the “safer” bet. In those days, folks at home got a kick out of a player powerfully dunking it home on their helpless opponent. It was the era of flight, where aviators like Michael Jordan and Julius Erving would wow their fans with acrobatic moves near the rim. The three-point shot was still very new to the game, and while players certainly didn’t shy away from it – they very rarely lived by it. The NBA continued to evolve, and by the time the 90s came around, you had players like Reggie Miller and Ray Allen who were three-point marksmen. By the new millennium, you had guys who were considered three-point specialists, such as Peja Stojakovic and Kyle Korver, and they could be relied upon to knock down the important three-pointer when necessary. Lakers star Kobe Bryant also had a pretty big reputation for making big threes at the end of games, as did fellow teammate Robert Horry, known colloquially as Big Shot Rob. And yet… as popular as the three-point shot had evolved, it still wasn’t “cool.” Or at least, it wasn’t as cool as it would become when Steph Curry came into the league. When he was drafted by the Warriors in 2009, he was a promising prospect with a great three-point stroke – but no one could’ve predicted how he would change the game. It didn’t happen right away – but after a few years of NBA experience, the league couldn’t believe what they were seeing. It wasn’t just what he did, but how he did it. By Steph’s seventh NBA season, he was averaging 30 points and five made threes per game – and he did it nonchalantly. He shot three-pointers like they were layups, with awe-inspiring ease, and off-putting quickness. If he had the ball near the three-point line, you could blink your eyes and he will have landed a trey before you even realized it. Eventually, people started calling him the greatest shooter of all time. Here’s what it all comes down to. We can sit here and talk for hours about the mind-blowing statistics that came from Steph Curry’s three-point boom. But at the end of the day, the NBA is about entertainment. And from that perspective, Curry changed the league in a way no one saw coming. The three-point shot had now become more entertaining than we ever could’ve imagined it. Led by Steph, players all around the league now received a boost of empowerment to hoist the long ball to their heart’s desire. And their coaches encouraged them to do so as well. Perhaps something that enhanced Curry’s effect was the fact that he was teamed up with another three-point genius – Golden State forward Klay Thompson. While not the shooter that Steph was, he’s enjoyed a sensational career from beyond the arc, and has broken his fair share of records as well. 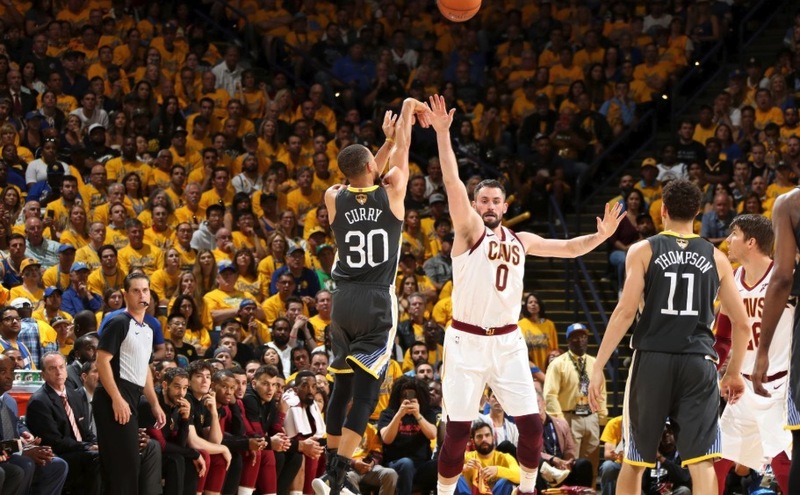 Combined, the pair have been labeled the “Splash Brothers,” and if you were wondering how the three-point shot became cool – it was largely thanks to them. In light of this wave, kids at home are now working on their three-point shot more than ever. NBA players are shooting further beyond the line than they ever have. The league average for attempted three-pointers per game has jumped dramatically from 13.7 in the 1999-2000 season, to 31.4 in the 2018-19 season. Basketball is certainly evolving before our very eyes, and it’s unclear where exactly this road will take us. Will future players become so gifted from long range that the NBA will invent a new, farther out, four-point shot? Maybe that’s jumping the gun a little bit, but in this future three-point focused era, there’s no telling what may eventually take place.